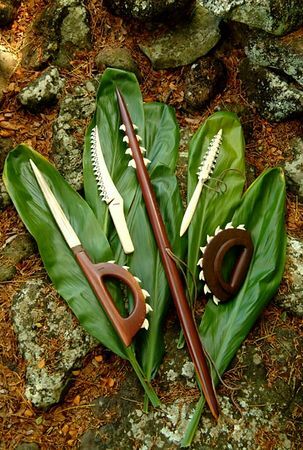 The first four (l to r) are pahoa (daggers) and the last is a lei-o-mano (shark's lei) in a knuckle duster style. 1. Unknow if from pre or post European contact. The point is a marlin bill and the handle is made out of kauila with tiger shark teeth imbedded. Very devastating weapon. 2. Made from whale bone with baby tiger shark teeth. 3. Classic pahoa with eight tiger shark teeth imbedded in the front. 5. Lei-O-Mano in knuckle duster style. Made from uhiuhi (very rare native hardwood) with tiger shark teeth.